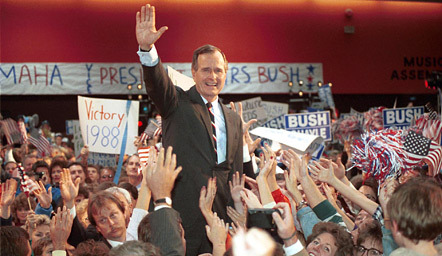 Monday: Learn about the kinder, gentler Daddy Bush on "American Experience." Plus: What did you think of "This American Life" on Sunday? On tonight's "American Experience" (9 p.m. EDT on PBS, check listings), we learn all about George H.W. Bush, the kinder, gentler Bush whose biggest foible may be having brought the most damaging, reckless and corrupt president in U.S. history into the world. Why did you do it, Daddy Bush? Why? Why? Georgina and Serena go head-to-head on "Gossip Girl" (8 p.m. EDT on the CW) while "Cities of the Underworld" profiles secret Soviet bases (9 p.m. on the History Channel). And since there's really nothing more entertaining than a room full of scorned hoochies, you probably won't want to miss "The Bachelor: The Women Tell All" (10 p.m. on ABC). What did you think of "This American Life" on Sunday? Go here to discuss.